Original publication date: Wednesday May 30, 2018. Magnetic materials are very important in industry and modern technology and have been used for fundamental studies and in many everyday applications such as sensors, electric motors, generators, hard disk media, and most recently spintronic memories. As thin film growth has improved over the past few decades, so has the ability to control the structure of crystal lattices—or even force structures that are impossible in nature. This new study demonstrates that Ru can be the fourth single element ferromagnetic material by using ultra-thin films to force the ferromagnetic phase. “Magnetism is always amazing. It proves itself again. We are excited and grateful to be the first group to experimentally demonstrate and add the fourth ferromagnetic element at room temperature to the periodic table,” said University of Minnesota Robert F. Hartmann professor of electrical and computer engineering Jian-Ping Wang, the corresponding author for the paper and Quarterman’s advisor. “This is an exciting but hard problem. It took us about two years to find a right way to grow this material and validate it. This work will trigger the magnetic research community to look into fundamental aspects of magnetism for many well-known elements,” Wang added. Other industry leaders agree that this discovery will have an impact on the semiconductor industry. 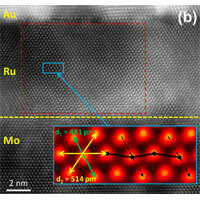 Building upon the established theoretical predictions, researchers at the University of Minnesota used seed layer engineering to force the tetragonal phase of Ru, which prefers to have a hexagonal configuration, and observed the first instance of ferromagnetism in a single element at room temperature. The crystal structure and magnetic properties were extensively characterized by collaborating with the University of Minnesota’s Characterization Facility and colleagues at the University of Wisconsin. In addition to Quarterman, Wang, and Voyles, researchers involved in this study include Javier Garcia-Barriocanal from the University of Minnesota Characterization Facility; Yang Lv from the University of Minnesota Department of Electrical and Computer Engineering; Mahendra DC from the University of Minnesota School of Physics and Astronomy; Sasikanth Manipatruni, Demitri Nikonov, and Ian Yang from Intel Components Research; and Congi Sun from the University of Wisconsin Department of Materials Science and Engineering. This research was funded by the Center for Spintronic Materials, Interfaces and Novel Architectures (C-SPIN) at the University of Minnesota, the University of Minnesota Distinguished Doctoral Fellowship, and the National Science Foundation (NSF) through the NSF-funded Materials Research Science and Engineering Center at the University of Minnesota.